The ZSK Stickmaschinen Open House is a much-anticipated show for sewing and embroidery enthusiasts. It’s here that we get to see the latest in embroidery technology, and with this event occurring bi-annually, there’s always plenty to be excited about when the show finally returns. This year we journeyed to Krefeld in Germany on September 22nd for the 2018 show. There were a great many contributions to the exhibition, many from lines we already stock here at Stocks Sewing Machines, such as updates to the ZSK Industrial Embroidery machine lines Racer and SPRINT. The SPRINT line now supports three new models: the SPRINT 7, SPRINT 7L and SPRINT 7XL. These models are overtaking the SPRINT 6 line, though the SPRINT 6 and SPRINT 6XL are being continued as 12 needle models. The SPRINT 7 models are all equipped with an amazing 18 needle setup and servo drive systems. 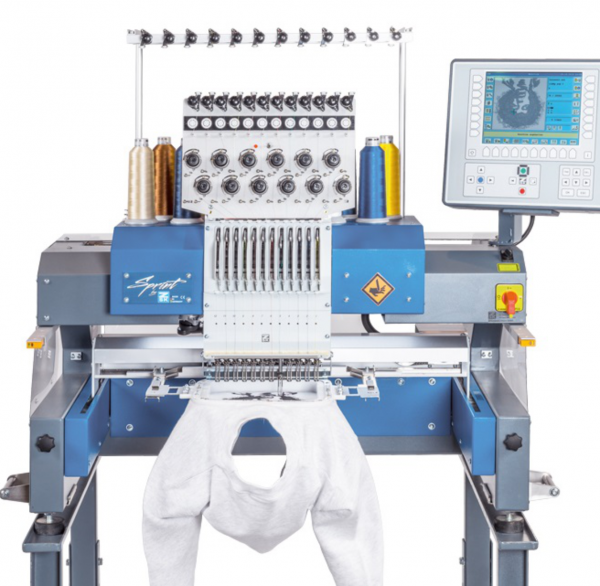 You’d expect the SPRINT 7 line to be an upgrade from the SPRINT 6, and they certainly are; boasting an improved efficiency on longer stitch lengths and the ability to choose design starting points the new line offers a better embroidery experience for you and your staff. If you’re interested in working on larger products, you’ll be interested in the SPRINT 7L and 7XL models which, as their nifty names imply, work with large and extra large products respectively. The Sprint 7L features an embroidery field of 40 x 60cm, and the XL 40 x 140cm, offering you greater flexibility for use. The RACER line has seen an expansion on its border frame machines: introducing the RACER 2XL and the RACER 0218. The RACER 2XL has an embroidery field of 700 x 700mm per head, with a total of 24 needle heads. The RACER 0218, by contrast, has 18 needles per head but is also equipped with a D-Drive, allowing a single head to produce designs up to 1.1 x 700mm. The ZSK Embroidery Technology Magazine for Autumn 2018 celebrated the ZSK event with an interview with their Sales Director for Technical Embroidery Systems, Michael Metzler. In this interview, Metzler summarised the last thirty years of embroidery, concluding that the industry has seen revolutionary technological innovations during this period, making this industry a truly exciting one to be a part of in this day and age. We’ve moved from the mechanical creation of paper cards to electronic digitizing systems to formulate our patterns. Today, ZSK equipment can achieve some real technological feats, such as the laying of wires on flexible materials (think: car seat heaters, diving gear, patient observation via wired bedsheets), as well as TFP (Tailored Fibre Placement), LED sequins and moss electrodes. This potential for embroidery technology to stay up-to-date with the modern world means that the future is promising for embroiderers. E-Textiles and Smart Textile industries are innovative and interesting fields for both old hands and budding enthusiasts to tailor their business to. There is currently a great deal of interest in how the world can be shaped by textiles, from healthcare to comfort. Michael Metzler extols the embroidery industry for being able to create prototypes from blueprints quickly – an innovation that Metzler claims only embroidery has access to. This allows for embroidery-based technological improvements to be quickly trialled and is perhaps why there are so many fascinating new products available right now. Moss embroidery, in particular, is an amazing technological innovation that has come from this technology; used to collect biomedical signals from patients, embroidery has never been so important. It can be made automatically at low costs, and can also be put under high customisation requirements. Moss embroidery has its roots in chenille fabric techniques which are used to create towels and piled carpets. By creating the mossy surface out of conductive threads, the material can be used as a form-fitting electrode. Conductivity has been shown to increase when individual ‘tufts’ of the conductive thread are compressed against the skin’s surface, allowing for a suitable biomonitor that can be worked into worn garments, or even function as electro-stimulation therapy for those in need of tissue rehabilitation. The ZSK biannual event of 2018 has brought both new machines and new ideas. The development of the smart textile industry brings the potential for the expansion of the embroidery industry, and it ensures our place in the future of Industry 4.0. If you’re looking for a high-flying industrial embroidery machine, new or used, we stock plenty of machines from top brands so that you too can be part of the thread revolution.